Hanoi (VNA) – The Shah Alam High Court in Selangor state of Malaysia on April 1 sentenced Vietnamese Doan Thi Huong, a suspect in the murder of a man holding a Democratic People’s Republic of Korea (DPRK) passport with the name of Kim Chol, to three years and four months imprisonment. The verdict came after judge Azmi Ariffin announced at the April 1 trial a lesser charge for Huong, which was causing injuries using dangerous means instead of the previous charge of murder. The trial was attended by Vietnamese Ambassador to Malaysia Le Quy Quynh. 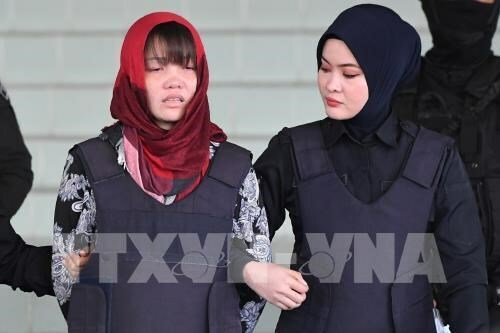 Huong and an Indonesian woman named Siti Aisyah were accused of poisoning the DPRK citizen travelling under passport name of Kim Chol with liquid VX, a banned chemical weapon, at Kuala Lumpur airport in February 2017.